President Evo Morales introduces country's newest, biggest renewable energy source, the 180 hectares solar panel plant in Potosi. 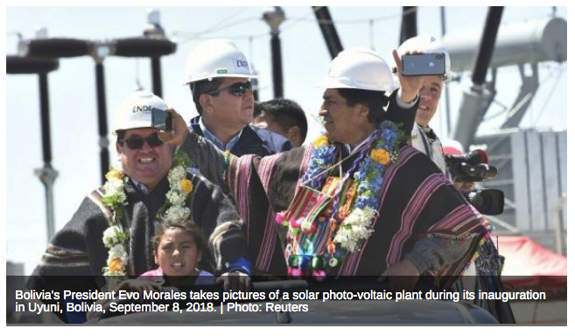 Bolivian President Evo Morales inaugurated the state-run National Electricity Company's (ENDE) solar plant Saturday, making it the country's largest and third large-scale state solar producing operation. The panels expand across 180 hectares of land in Potosi has the capacity to generate 60 megawatts (MW) allowing it to power half the department, or about 880,000 inhabitants. "Bolivia is living its best times in history with so many small and large projects," said President Morales. The panels were constructed by the Spanish-Bolivian consortium, Emias-Elecnor with $US73.6 million from ENDE and the state's Central Bank of Bolivia (BCB). The Uyuni photovoltaic system is the country's largest with the Yunchara and Cobija solar systems already producing 5 MW each. The head of state said other alternative energy projects, such as wind and hydrothermal plants, are also underway in Potosi adding, it's "guaranteed energy." Energy Minister Rafael Alarcon said the "solar photovoltaic plant (in Uyuni) is the country's largest alternative energy producer." "We are close to producing 150 MV in renewable energies (in our country that consumes) 2,100 MV. It costs a lot, the investment is very high but we are committed to mother earth and the decrease of carbon dioxide," said Alarcon. The minister added that Bolivia is "universalizing" its energy sources and is even going to start exporting to Argentina in the near future. Last Wednesday, the Argentine government approved ENDE's Argentina Transmission, SA (ETASA), to begin building a transmission line into its neighboring country to begin exporting renewable energy by next year. Morales said that the initial sale to the Argentine market would be 100 megawatts.